After another excellent weekend of Six Nations action where England crushed France, Ireland hit back in Scotland and Wales ground out a win in Italy, Joe Harvey selects his team from Round Two for TRU. 1. 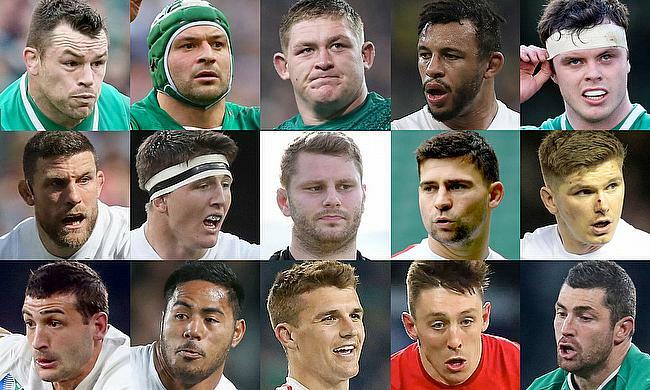 Cian Healy (Ireland) – Well, what you will notice is that this entire front row is made up of Irish players. Healy may have scored a try last week, but at Murrayfield on Saturday, his work was mainly in the scrum. Nullifying the Scottish tighthead, Simon Berghan, Healy hardly allowed Scotland an inch, apart from maybe two clashes. Added to this, his mobility around the field and effective carries of the ball, Healy was a class above. 2. Rory Best (Ireland) – The second of this Irish trio is the captain, Rory Best. A former Northumbria University student, Best was top of the class on Saturday, not showing any faults in his game at the age of 36. Throwing the ball in perfectly, Best was at many of the rucks and is extremely mobile. 3. Tadhg Furlong (Ireland) – The third and final Irish front-row player, Tadhg Furlong, was another influential prop in a fairly dominant forwards performance for Joe Schmidt’s side. Struggling a bit early on against Allan Dell, Furlong eventually gained dominance over his opponent and was showing his ball handling skill and defensive ability. 4. Courtney Lawes (England) – Lawes stepped in for Maro Itoje with relative ease, his highlight easily being a big hit on Mathieu Bastareaud late in the second half. Lawes caused a couple of turnovers and was, as ever, an extremely reliable option in the lineout, but it is his defence that stands Lawes apart from many of his peers. 5. James Ryan (Ireland) – Ryan really brushed off the cobwebs after the defeat to England last week. It’s amazing to think that at the age of 22, Ryan is perhaps Ireland’s most important second row. A consistent lineout option, Ryan went everywhere on the pitch, playing the full game. He was head and shoulders above his Scottish opposition. 6. Mark Wilson (England) – A second inclusion in the first two rounds of the 2019 Six Nations, Mark Wilson is quickly becoming one of World Rugby’s most impressive backrow players. With an incredible engine, Wilson gets to every ruck in attack or defence. The Newcastle Falcons man is so consistent and so sound across the board. It is great to see the Cumbrian performing so well on the international stage. 7. Tom Curry (England) – Tom Curry’s display on Sunday will mainly be remembered for the head injury he sustained in the second half, gushing blood all over his face, almost in homage to Terry Butcher. However, also making over 20 tackles, making nearly every ruck and carrying the ball to great effect, Curry was playing above his years. 8. Thomas Young (Wales) – Playing at openside flanker for Wales in this fixture, Thomas Young was one of Wales’ most dominant performers in Rome. A constant disruption at the ruck for Warren Gatland’s side, the Wasps man had a try chalked off when the clock was in the red. In a much changed and disjointed Welsh performance, Youngs outshone many of his teammates. Maybe a performance that will see him take on England in Wales. 9. Ben Youngs (England) – Ben Youngs has been much maligned at club level in recent times, but his current international form has been beyond impressive. His distribution from the base of the ruck was extremely consistent, often giving the English a positive attacking platform. On top of this, Youngs’ box-kicks were nearly always inch perfect and were consistently competitive and made it easier for the English to regain possession. 10. Owen Farrell (England) – Owen Farrell showed every good aspect of his game against France on Sunday. As well as his ordinary passing game, Farrell continued to be impressive with the boot, along with Ben Youngs, to create opportunities for the English attack. What was noticeable was Farrell’s guidance. He led his country extremely well and calmed down Kyle Sinckler effectively after the prop started a fracas. 11. Jonny May (England) – Scoring three tries at Twickenham on Sunday, Johnny May had a day to remember as he scooped up the man of the match award against the French. Using his electric pace for his first score, May has really taken huge leaps forward from around four years ago when many doubted the now Leicester Tiger. 12. Manu Tuilagi (England) – Tuilagi has stepped back up to international rugby with yet another fantastic performance on Sunday. Mainly used in defence, Tuilagi was an effective defender for Eddie Jones’ side as they only gave up eight points at Twickenham. 13. Henry Slade (England) – Slade has certainly arrived on the international stage. It seemed like many were uncertain about the Exeter Chiefs man during the 2015 Rugby World Cup but fast forward four years, Slade has to be England’s incumbent outside centre. Scoring his third try of the 2019 Six Nations on Sunday, Slade contributed to England’s kick and chase as well as distributing reliably for the backs. 14. Josh Adams (Wales) – Adams backed up his solid performance in Paris with another good performance in Rome. The Worcester Warriors man added another try to his tally, reinforcing his continued selection by Warren Gatland. With England in the next round, Adams will be going into that huge clash as one of the form wings in this competition. 15. Rob Kearney (Ireland) – Kearney’s performance at Murrayfield was much more like what Ireland should be expecting from a fullback performance. Unflappable in the air, Kearney’s running with ball in hand was fantastic, regularly beating his opposite number and putting Ireland into space to build an attack and get them out of trouble.